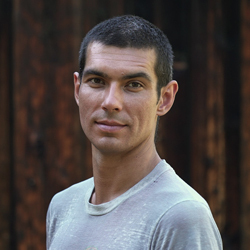 Trevor Mack is an award-winning Tsilhqot'in nation filmmaker from the interior of British Columbia, Canada. His first short film, The Blanketing (2013), premiered at imagineNATIVE and screened across North America and in New Zealand. Since then his short films, including Clouds of Autumn (2015), Anna Marina (2017) and ʔEtsu (2017), have premiered at prestigious film festivals around the world, such as the Toronto International Film Festival and the American Indian Film Festival. His work has received 'Best Canadian Short Drama' at the imagineNATIVE Film + Media Arts Festival and 'Best Cinematography' at the Air Canada enRoute Film Festival. Currently, he is producing two feature films to be released by 2020. Sara Roque is a filmmaker, writer, activist and cultural leader who has worked on many arts initiatives and projects in Canada and abroad. She is the former Indigenous Arts Officer at the Ontario Arts Council where she worked for ten years mentoring artists and building innovative programs, policies and protocols with Indigenous peoples in the province. She is a documentary filmmaker and co-founder of the O’Kaadenigan Weengashk Arts Collective. Her education includes Indigenous Studies from Trent University and Dechinta Bush University’s summer program. Sara is a mixed blood Anishinaabekwe from Shebahonaning-Killarney Ontario and resides in Toronto. Theola Ross is from Pimichikamak Cree Nation in northern Manitoba and speaks Cree. She is a recent graduate of the Bachelor of Social Work Program at Ryerson University and Toronto is her second home. She has experience working with individuals struggling with a social-cultural context within social discourse. Her expertise includes both being raised on reserve and living in an urban setting. Her spirit name is Matwewestin Iniw (a person who hears the wind). Her film Twilight Dancers, which she co-directed with Paola Marino, screened at imagineNATIVE in 2017. Sardaana Savvina (Sakha) works as a producer, a film researcher, and a champion for Indigenous-made films. She is the founder and leader of the Sakha Cinema Club, which is a primary promoter and advocate for Indigenous productions in the Sakha Republic. She was a programmer of the Yakutsk International Film Festival and is now a programmer for the International Arctic Film Festival "Golden Raven", Chukotka. For 13 years she worked at the Arctic State Institute of Culture & Arts as a lecturer and a head of the International Office and currently works as a producer at Sakhafilm Company. Ervin Chartrand (Métis/Ojibway) is a Winnipeg-based filmmaker. Chartrand was incarcerated in his late 20s which proved to be a turning point in his life; upon gaining parole he enrolled in broadcasting and acting courses and worked on various film and TV projects. Determining to make his own work, he has since directed numerous films including the award-winning shorts 504938C and Patrick Ross, which won the ReelWorld Award for Outstanding Canadian Short Film at the 2006 ReelWorld Film Festival. He recently completed a Bachelor of Arts Degree in Film Studies at the University of Winnipeg. Tasha Hubbard (Cree) is an award-winning filmmaker and an Associate Professor at the University of Alberta's Faculty of Native Studies. Hubbard won a Gemini Canada Award for her first solo project, Two Worlds Colliding, an exposé of the infamous “starlight tours.” With her acclaimed 2017 documentary Birth of a Family, Hubbard parses the Sixties Scoop legacy, a practice that saw more than 20,000 Indigenous babies removed from their birth families and placed in foster homes or adopted. Hubbard speaks and writes widely on racism and Indigenous media both in Canada and abroad. Nyla Innuksuk (Inuk) is a producer of film and VR/AR content and is the founder of Mixtape VR. She wrote and produced the short film Kajutaijuq: The Spirit That Comes (2014) which premiered at TIFF and was named one of the TIFF Top Ten Shorts that year. Nyla is a writer for Marvel Comics and co-created the character of Amka, an Inuk superhero. She was recently selected by Google to be included in their exclusive Google Jump program for new media storytellers and is directing her first feature 2D film called Slash/Back. Tara Miller (Maliseet) is a Toronto-based artist studying animation at Sheridan College. She is trained in multiple art forms including painting, printmaking, and sculpture, and enjoys telling stories through her art. Tara’s first foray into video games was the short platformer, Sealskin which showed at imagineNATIVE 2016. She is the lead artist and animator at Achimostawinan Games and is currently working on the Indigenous future cybernoir game Hill Agency. 1984 with a particular interest in the intersection of Plains Cree culture and digital technology. His work has been exhibited across Canada and internationally, and featured in publications such as Fuse Magazine and Canadian Theatre Review. He is currently a member of the Indigenous Routes collective which teaches video game development to Indigenous girls.